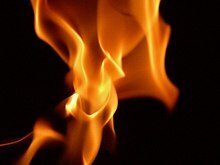 A flam or flame (frae Laitin flamma) is the veesible, gaseous pairt o a fire. It is caused bi a heichly exothermic reaction takkin place in a thin zone. Very het flams are het eneuch to have ionized gaseous components o sufficient density tae be conseedereid plasma. ↑ Law, C. K. (2006). "Laminar premixed flames". Combustion physics. Cambridge, England: Cambridge University Press. p. 300. ISBN 0-521-87052-6. This page wis last eeditit on 23 Apryle 2017, at 20:00.